It's been a fun WEEK OF ALEX series of posts, but my solitary posting is coming to a close as Wendy is due home later tonight. To be perfectly honest, I can't wait until she's back. I grew up an only child, so I can exist on my own pretty comfortably, but our home really isn't our home without Wendy here with me, it just feels sort of empty. Not to get too sappy on you, especially with all of the fun we've had with WEEK OF ALEX. Don't worry, it's not you, it's me. Since we moved into our house in 2003, the energy efficiency of our front door/vestibule area has always been a fairly significant issue. We've struggled with the fact that just getting near the door you can feel how warm or cold it is outside. It was so bad that you can actually see through the cracks in the door or above the door directly to the outside. It was so bad that the old inner double doors would open on their own with the slightest breeze. It was so bad that you could hear wind whistling through the large mail slot. Do you get the picture? It was bad. With our reconfiguration effort and adoption of our new salvaged front door, I wanted to do a few things to make our new setup more energy efficient while maintaining an historic look. In other words, I didn't want to cut into the door to install foam, compression weather stripping, or spring loaded vinyl weather stripping that pops out when you close the door. And I really didn't want to do anything like vinyl or foam that will quickly wear out or possibly grow mold. 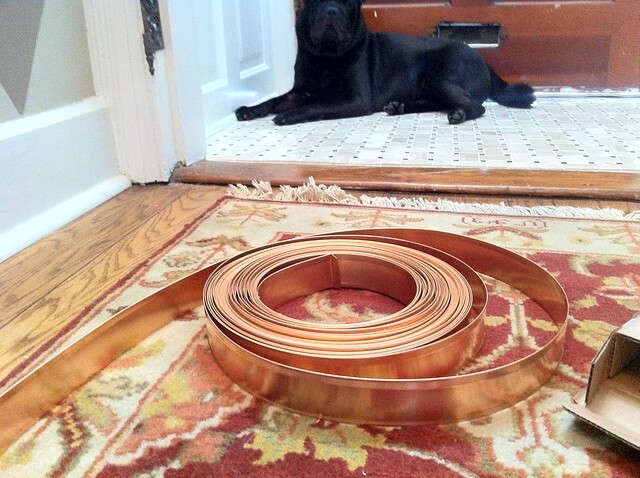 The solution for historically correct weather stripping that will last another 100+ years is actually quite simple, it's called Spring Bronze. Spring Bronze is type of metal weatherstrip that is nailed to the door jamb on one side and springs away from the jamb on the other side. The idea is that it compresses against the door when it is closed, preventing drafts from infiltrating the interior of the house. Over the years I've purchased all of my spring bronze from one place, Killian Hardware. They have so many cool things, like plaster buttons, very worth checking out their inventory. I bought a 100' roll of 1 3/4" Spring Bronze a little while back and have been using it for window and door weatherstripping for a few years now. I decided to use this for the hinge side of the new door. 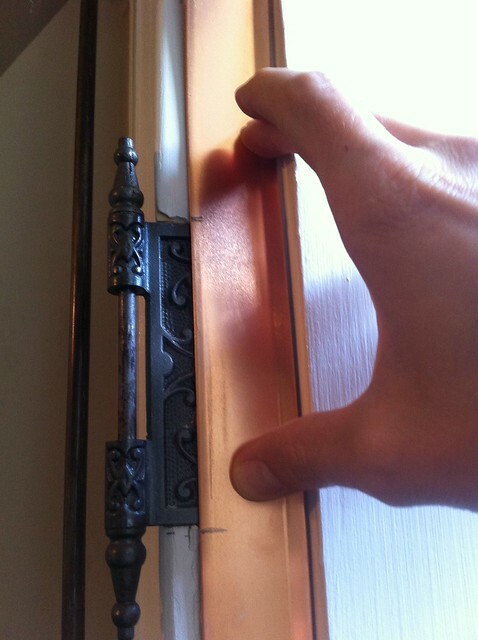 As you can see from the following photo there used to be spring bronze weather stripping installed in this door way at some point. You can tell this by all of the nail holes that are still visible on the right hand side. I started by measuring the length of the door jamb to cut the necessary material from the roll. Since this was is going on the hinge side I needed to cut out a partial section of the material so it doesn't obstruct the hinge. 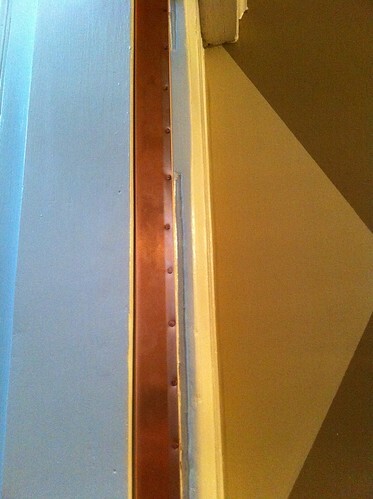 The first step was to hold the Spring Bronze up to the jamb to mark the hinge locations. Once the locations were marked, I used tin snips and normal scissors to cut away all of the back edge of the Spring Bronze. Then I lined the Spring Bronze up in the opening and partially drove two nails to get the weatherstripping started. Though I've seen you are supposed to place the nails 1 1/4" apart, I like to place them a little further. Using a ruler, I make marks with a pencil every 1 1/2" so I have an easy time placing the nails. 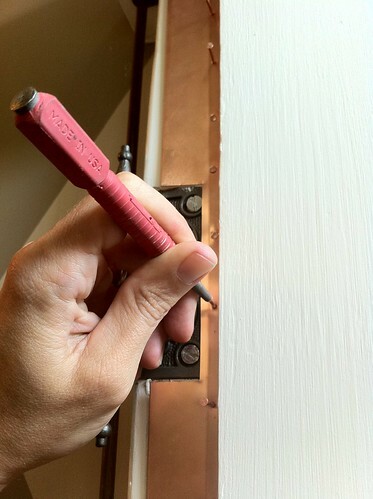 On the hinge side the nails usually go towards the inside of the jamb. 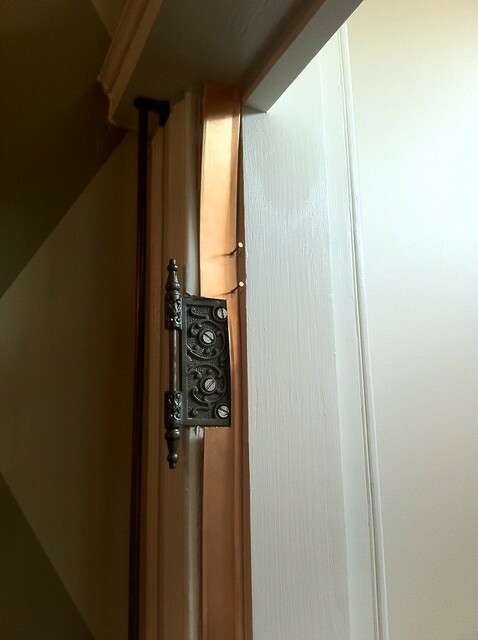 As the door closes the edge of the door pushed the Spring Bronze tight against the door and jamb. 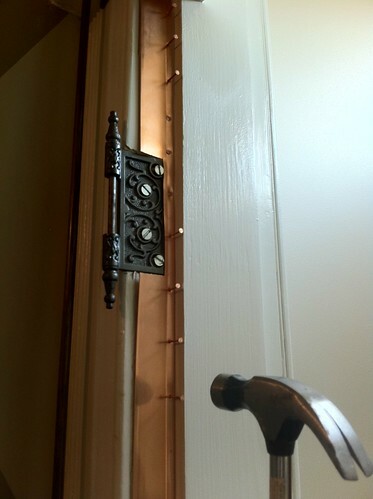 But the placement of the nails makes it very difficult to use a hammer to drive them all of the way in. So I used a small hammer working from the top to the bottom to place the nails just deep enough to secure the weatherstripping. Then I used a nail set to drive the nails the rest of the way into the jamb. This takes some patience, but you have so much more control driving the nail this way. 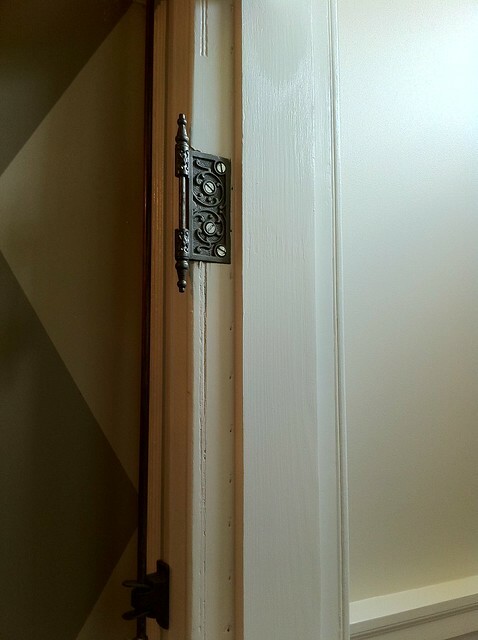 Finally, after what seemed like hours of hammering (and I'm sure my neighbor thought another earthquake was occurring), the hinge side weatherstripping was securely in place and ready to protect us from the cold. The knob/lock side of the door required a smaller 1 1/8" size of Spring Bronze because it is nailed on the opposite side of the jamb (the side towards the room), so I ordered a small kit from Killian for that. I following the same process as the other side, but was able to drive the nails all of the way in using just the hammer, no need for the nails set on this one. 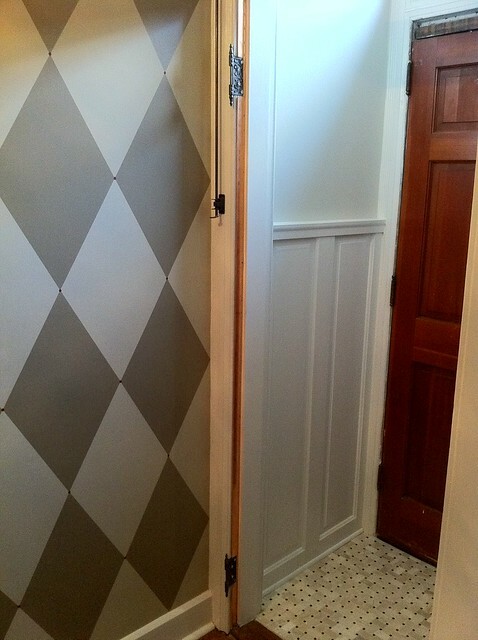 One final thing I added before the whole weather stripping endeavor was an upper jamb stop for the door. The old opening didn't have one because someone added that molding at the top of the jamb. I have no idea why that happened, but we decided to leave it that way. The same thing happened on the outer front door, and that is why you could see right through the top of the door. So I cut a piece of scrap poplar that would fit in the opening. I installed it with pocket hole screws and then filled the holes with some wood epoxy. Then I sanded the epoxy smooth an caulked the edges (using Big-Stretch caulk, of course). I added a little primer and paint, and we were good to go. And that takes us one major step closer to putting the salvaged door in its permanent home. Let's take a moment to see where we are on the massive front vestibule checklist. We're getting close, I can feel it. So far so good. I really feel like I got a fair amount of work accomplished during the WEEK OF ALEX. What do you think? Should Wendy be happy with what I've done, or should she come back into town tonight shaking her head and asking "WTF have you been doing, acting like this is a WEEK OF ALEX or something?" To which I will say, "I no acting, Baby!" Did You Hear? There was an Earthquake in Virginia! Is installing spring bronze difficult? Or just tedious? If I ever get around to rehabbing windows and doors around here, that's what I'd like to use. No, not difficult at all, just time consuming with all of the hammering. You just need a good and sharp pair of scissors, a hammer, nail set, tape measure, and pencil. Be sure you nail from the top and work down (or from one side across to the other on horizontal sections). No matter how much you try, if you start at either end and work towards the middle, there will be a large bump of spring bronze you are stick with. Also, make sure you get it nice and straight with the first two nails, you can't easily correct the angle if it isn't straight. 1. White vinegar. Simply put the screws in a container of vinegar and wait for them to darken. 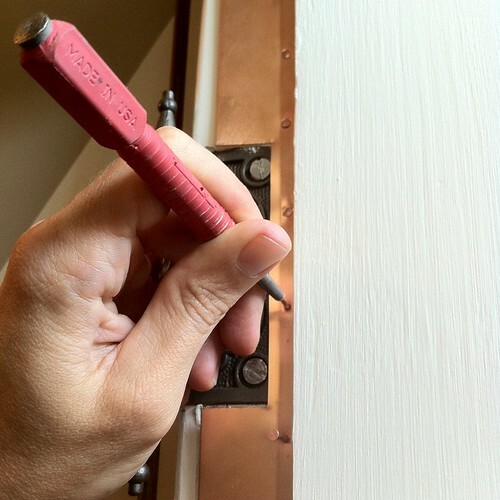 This works well on zinc coated screws as well. Depending how long they are in there, they can look like weathered steel, or pitch black, but keep an eye on them. I'd say about an hour should be ok, but it can take several hours depending how dark you want them. DO NOT LEAVE THEM OVERNIGHT, they will completely corrode/dissolve. 2. Gun Blue. This is a small bottle of liquid, cost about 5-7$, and works within seconds. Depending on the steel, it may turn bright blue (which is what it's supposed to do), or purple-ish, but repeated applications will darken it further. Hah, so funny you posted this. I actually have a small container of Gun Blue I've been using for several years to antique all of my screws. I'm planning a post on it later next week. I haven't tried the vinegar. I have some zinc coated screws I'll have to try this on. Well, I'm a clockmaker, so I have all kinds of tricks as far as aging wood, metal, and other surfaces. The gun blue tends to be fast and easy. If you try it on zinc screws, they won't take very long (maybe 10-30 mins, I can't remember) but they will definitely have a burnt smell to them after, because of the reaction. OK, now I know what that was that came OFF the door - in corroded chunks - after it snagged clothes and the dog's ear (she has a bad habit of thinking that anywhere she can get her pointy little nose into, the rest of her should fit). I was going to replace that door, but now that I know how to weather strip it, I may just refinish it. There may be some dry rot in it, and there's certainly some other weather damage. I'll have to try this method. We're going into our second Arizona summer with a huge, leaky antique plank door. It's not just uneven; the gaps dwarf normal weatherstripping. On the plus side, it's thick enough that the width of the of the spring bronze won't really matter. Thanks for your posting on spring bronze! The photos and description were very helpful! Is spring bronze suitable weather stripping for garage doors? May 2018: I was searching for replacement exterior door weatherstripping for my 80-year old home when I discovered your article and website. My deteriorated weatherstripping is similar to yours new bronze stripping; however, I discovered that there is a 1/8" x 1/2" felt strip behind the bronze spring loaded strip. I am assuming this may be there to dampen any potential vibration frequencies that may develop with pressure differential through the door during severe wind conditions. What do you think? Should I add a felt strip behind the spring bronze strip? Thanks for the insight on spring bronze. In our 1950s Cape Cod we suffer from the brutal front door draft. But after reading this, we’ve decided to replace the spring bronze on the door instead of sticking the vinyl stuff where it won’t look good or work very long. 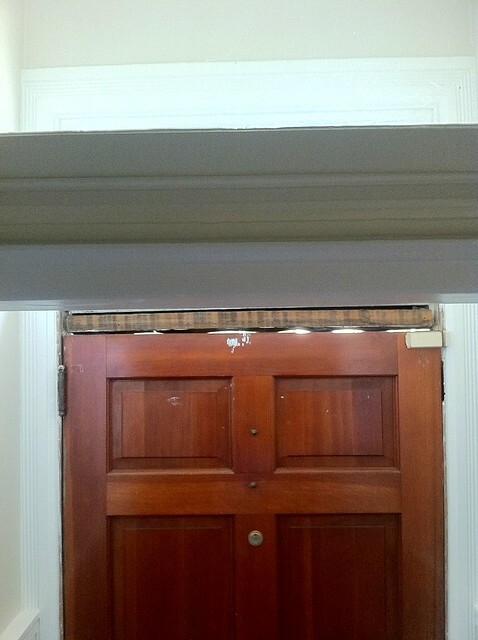 Our wood door is the original, as is the mail slot and the recessed sidelights (single pane). 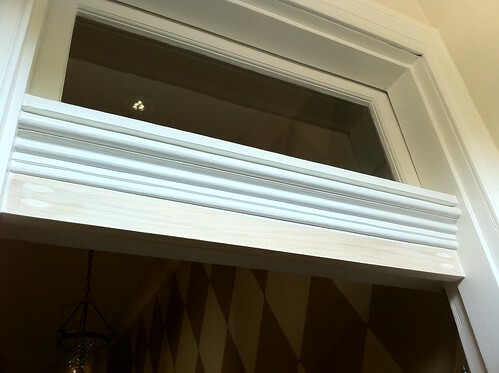 We know all too well of the outside light peeking in around the bottom and the lower corners. 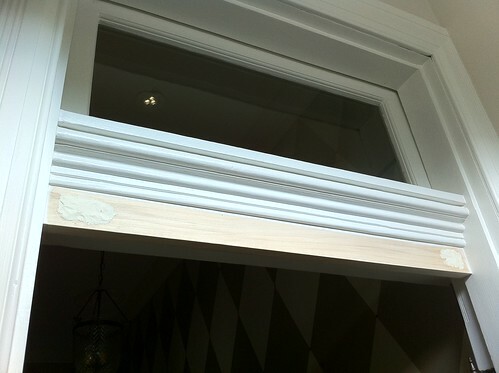 We also considered a storm door but ultimately decided to forego that as well.